Volatility has been low and falling across many markets for months. 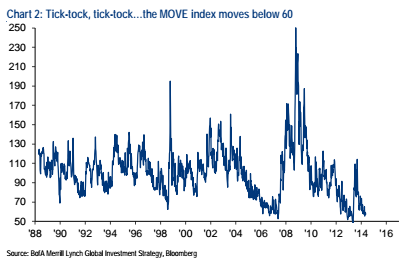 Volatility in US equities, measured by the CBOE Volatility Index (the VIX Index), has returned to the low levels seen ahead of the Great Financial Crisis (GFC). Volatility of US Treasury bonds, measured by the Merrill Lynch Option Volatility Estimate (the MOVE Index), is also back to 2007 levels. Currency and commodity volatility has also fallen to rock bottom levels. Past experience shows that while current low levels of volatility have persisted at times for over a year. Investors are lulled into a "comfortably numb" attitude in which they act as if low volatility equates to limited investment risk. Unfortunately, periods of persistent low volatility have often ended with sharp spikes upward in volatility. In three recent episodes, in 2007-08, in the spring of 2010 and the spring and summer of 2011, the periods of low volatility have ended with sharp corrections in equity and credit markets and rallies in high-quality government bond markets. In one recent episode, in the spring of 2013, low volatility ended with a sharp selloff in government bond markets and a more moderate and temporary dip in equity markets. It is a bit puzzling why volatility is so low. Many of the types of factors that have caused volatility in the past are present currently. Geopolitical risks are not low, with tensions over Russia's annexation of Crimea, unrest in Ukraine, the territorial dispute between China and Japan, and elections in India and Turkey. Growth risks are not low, with global growth 1% lower than forecast in 1Q14 and OECD leading indicators now showing fading growth prospects in most regions. Although currently masked by rising food prices, deflation risks are not low and may prompt both the ECB and the PBoC to undertake further monetary easing soon. Equity valuations are stretched. In his quarterly letter to investors, Jeremey Grantham of GMO estimated US equities to be 65% overvalued, while John Hussman of Hussman Funds using similar methodology judges US equities to be 75% to 125% overvalued. Bond valuations are more difficult to judge, but most investors consider government bonds to be overvalued due near zero policy rates and large scale bond purchases by central banks. Credit spreads are tight, back to pre-GFC lows, for high yielding junk bonds and for European peripheral countries including Portugal, Ireland, Italy, Greece and Spain. As Jan Loeys, Chief Global Strategist at JPMorgan recently noted, "low volatility is not low risk". Falling volatility is sometimes a good thing for financial markets, but a lengthy period of persistent low volatility can have a downside: it can create moral hazard as it eliminates caution and encourages excessive risk taking and use of leverage. This results in what Jeremey Grantham calls "the driving force behind the recent clutch of bubbles: the 'Greenspan Put', perhaps better described these days as the 'Greenspan-Bernanke-Yellen Put', because they have all three rowed the same boat so happily and enthusiastically for so many years". Edward Chancellor of GMO goes on to explain, "Speculative bubbles tend to form when market participants believe that financial risk has been underwritten by the authorities. The 'Greenspan Put' appeared in the late 1990s after it became clear that the Fed was prepared to support falling markets but wasn’t going to act against the bubble in technology stocks. Fed policy hasn’t significantly changed since then. Monetary policy in the aftermath of the financial crisis has aimed to put a floor under asset prices, encouraging investors to take on more risk … Whenever a cloud appears over Wall Street, market participants have come to expect more quantitative easing and guarantees of perpetually low interest rates. The personnel may change at the Fed, but the 'Greenspan Put' remains in place." How will low Volatility end this time? 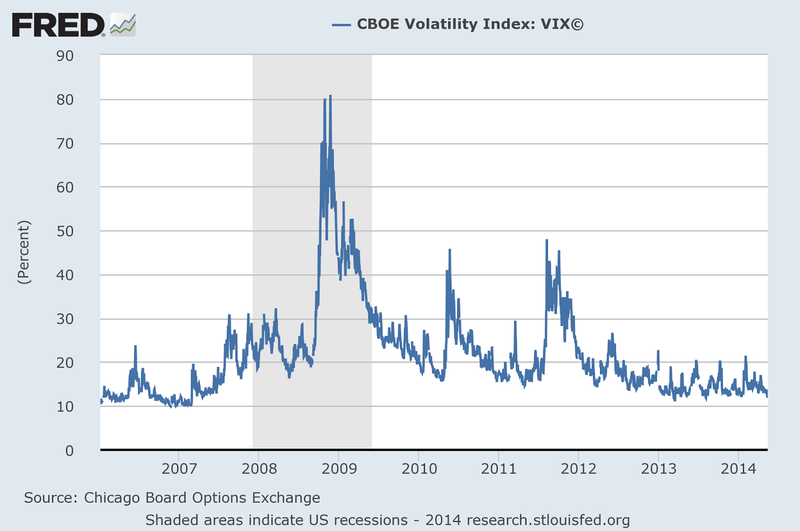 The relevant question for investors is when and how will persistently low volatility end this time? Will it end as it did in 2007, 2010 and 2011, with a sharp selloff in the equity and credit markets and rally in government bonds. Or will it end as it did in 2013, with a sharp selloff in government bonds and a more moderate and temporary dip in equity markets? In my view, the answer will depend on whether the consensus macro view plays out or whether the consensus once again proves too optimistic. The consensus view is that, despite disappointing growth in 1Q14, the US and global economies remain on track for markedly improved growth for the remainder of 2014 and 2015. This reacceleration in global growth is expected to further reduce unemployment, buoy wage growth and boost inflation from below target levels. If this consensus view plays out, the Fed will continue to taper its bond purchases and will need to consider the timing of the raising the policy rate sooner rather than later. The Bank of England and the Bank of Canada will face the same decision on when and how much their policy rates should rise. The ECB and the PBoC will likely not need to ease monetary policy further. In this consensus scenario, the MOVE Index of bond volatility will rise sharply as it did in the spring of 2013, bond yields will rise sharply. Equity volatility may rise, but not sharply and any dip in the equity market will likely prove temporary. However, if the consensus view proves too optimistic on growth -- as it has regularly in recent years -- the end of low volatility is more likely to be led by a sharp rise in the VIX Index. In this scenario, stretched equity valuations will come under heavy pressure as the economy fails to provide the profit growth currently built into equity prices. Global equities will face a sharp correction. Government bonds, which have already defied expectations and performed very well this year, will rally further. Some will argue that investors should use options strategies, which will benefit from a rise in volatility, but unless you are an options expert and a very active trader, such strategies can be difficult and expensive to implement. If you believe that the current period of persistent low volatility will end soon, I believe that there are three possible courses of action to protect a multi-asset portfolio. Two of these courses of action require taking a view on how the current period of low volatility will end. One does not. If you believe the consensus view will hold, reduce bond exposure and reallocate into cash temporarily. When equities dip, as they did last spring, move from cash into a heavier weight in equities to capitalize on the rebound in equity markets. If you believe US and global growth will meaningfully disappoint current consensus expectations, reduce equity and high yield credit exposure and temporarily reallocate to government bonds in anticipation of strong returns from further declines in bond yields. If you have no idea how the current period of persistent low volatility will end, trim risk exposures across all asset classes, moving temporarily into cash. When the inevitable rise in volatility occurs, it will be possible for the investor to analyze which scenario is playing out and, once it has run its course, where to put the cash back to work. Given the uncertainty over when and how the current period of persistent low volatility will end, and the risk of loss if the investor chooses one of the first two option and proves wrong, the prudent choice seems to be the third option. Another possible choice, with less decay than UVXY, is VQT, Barclays S&P 500 Dynamic VEQTOR Index. Although it was panned by Morningstar this week, it performed well during the volatility spike in 2011. Asset allocation my preferred approach.